Ivory silk taffeta set of bodice and skirt; worn over crinoline; chenille fringe on bodice, waist and back of skirt; embroidery of loops of flowers and leaves and black rectangles. 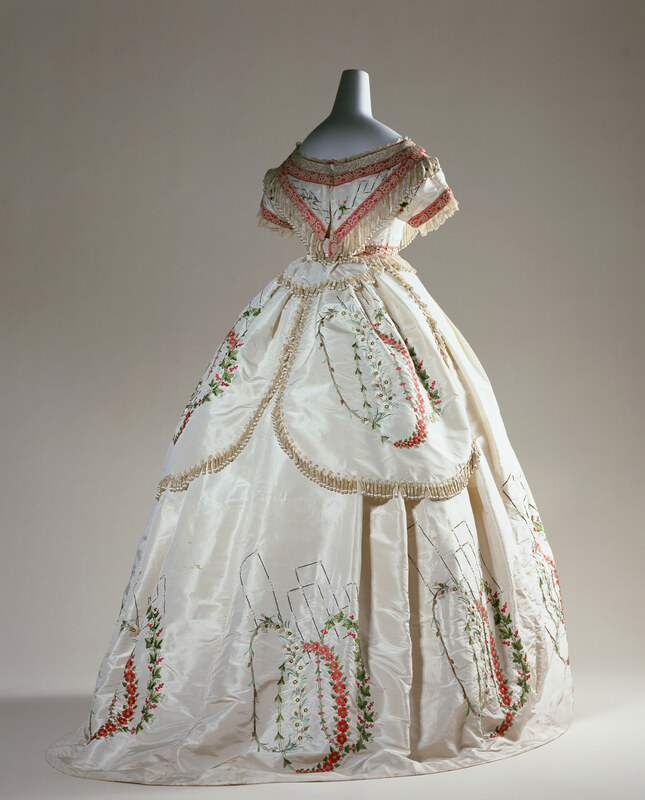 A dress in the crinoline style. The bold, embroidered pattern is strikingly arranged over the skirt. The front and behind of the body, the waist, and the oval panels on the back of the skirt are trimmed with delicate chenille fringes that accentuate the out-standing, luxurious appeal of the dress. This dress might be worn by one of the fashion leaders of the day. During the 19th century, on the one side men's fashion became increasingly functional and inornate, while on the other side women's wardrobes appeared more lavish and decorative than ever. Trimming decorations like fringes, tassels and braids ("passementerie") that required a lot of attention to detail appeared in numerous variations.